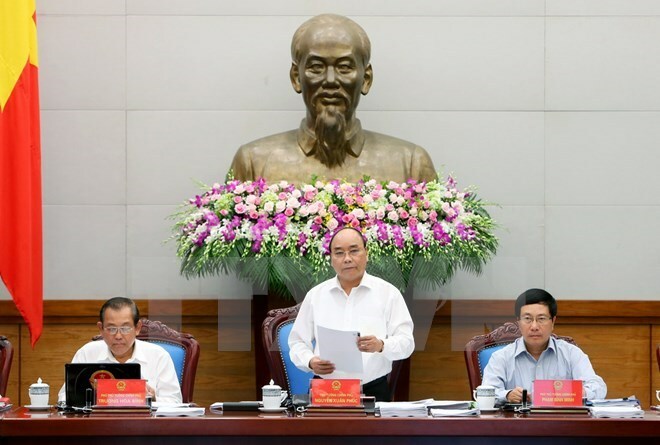 Hanoi (VNA) – Prime Minister Nguyen Xuan Phuc asked ministries and localities to take care of the living environment of the people following the environmental incident caused by Formosa Ha Tinh Steel Corporation. The Formosa Ha Tinh Steel Corporation officially apologised on June 30 to the Vietnamese Government and the people for killing tonnes of fish in the central coastal provinces since early April. The company has promised to pay 500 million USD in compensation to the Vietnamese people. The environment cannot be ignored by reason of economic development and foreign investment, he said at the government’s online meeting with provinces and cities on July 1. The government appreciated the cooperation of authorities at different levels and different sectors in the fight against Formosa violations, he said. He asked the Ministry of Agriculture and Rural Development and relevant agencies to craft support policies to fishermen, especially those in the incident- affected areas while the Ministry of Natural Resources and Environment devised an environment fund to remedy the environmental areas damaged by Formosa’s toxic waste. Priority must be given to long-term support for local seamen to have a means of subsistence. The Government leader said that support should be given to offshore fishing for long-term and sustainable effectiveness, asking concerned ministries to give direct support to seamen suffering from losses due to the fish deaths. The PM requested that the plan to use the 500 million USD received as compensation from Formosa should be completed by the end of this month. The most important task is ensuring Formosa commits to not repeating its faults, otherwise the company would be closed. Regarding socio-economic development tasks in July and the remaining months of this year, he affirmed that the Government’s responsibilities are to continue completing institutions, law and policies, and facilitating the growth of enterprises, while its determination is to step up economic restructuring extensively. The heads of ministries, agencies and localities were requested to raise their sense of responsibility. To achieve an economic growth target of 6.7 percent this year, it is necessary to carry out synchronous measures, with the focus on strengthening administrative disciplines at each ministry, agency and locality, especially those related to violations on public assets, use of State budget, and investment in fundamental construction, he noted. The leader also urged ministries, agencies and localities to follow the Government’s socio-economic development solutions, improve the business environment and support the enterprise community. He asked for quicker disbursement of investments to help increase production, particularly in the central, Central Highlands, and Mekong Delta regions.